The cost of dealing with the aftermath of the Fukushima meltdown has doubled. Japan’s national government plans to provide more loans to TEPCO. Japan’s Ministry of Economy, Trade and Industry (METI) has estimated that the cost of dealing with the aftermath of the Fukushima Daiichi meltdown, including the decommissioning, compensation paid to those affected, etc., could grow to some 21.5 trillion yen (USD195.5 billion, at USD = JPY110). Two major reasons for this are (1) decommissioning work is taking longer than originally expected, and (2) much more in compensation to affected farmers is necessary. This new estimate doubles the total cost from the former estimate of some 11 trillion yen. To help the operator of the devastated nuclear power plant, TEPCO, finance this massive cost, Japan’s national government has announced a plan to increase the maximum interest-free loan available to the power company from 9 trillion yen to 14 trillion. Yet how is the government going to finance this increase? It plans to finance it from increased usage rates for power provided by TEPCO and other major power companies. In short, the consumers of power will have to bear the burden of the expanded loans to TEPCO. This new estimate is to be presented to the relevant committees of the METI and the investigation committee of the ruling Liberal Democratic Party. Japan’s Nuclear Regulation Authority (NRA), in November, turned its back on its own “rule of 40 years” for nuclear power stations’ operation and gave the go-ahead to the “life prolongation” of Unit 3, Mihama Nuclear Power Plant (NPP), located in Fukui, Japan, and operated by the Kansai Electric Power Company (KEPCO). This was the third outdated reactor whose life prolongation was approved by the NRA, after Units 1 and 2 of KEPCO’s Takahama NPP, also located in Fukui, a prefecture situated in the middle of Japan along the Japan Sea coast. Moreover, Japan has seven other NPP reactors that have been in operation in excess of four decades and, including those seven, the nation has sixteen reactors in all that have been in operation longer than 30 years. If the NRA stays on its current path, we will see more and more outdated reactors put back to work, which increases the risk of another major accident. Any such an accident will lead to heavier financial burdens in its aftermath. Compensation, decontamination, decommissioning, and…. We have yet to see an end to any of these issues. We cannot let the current nuclear power policies remain as they are. If we do, more lives will be wasted, and Japan could be bankrupted. Germany has determined to abolish all its NPPs by 2022, and there have been firm moves to make Europe nuke-free. Taiwan has moved to the nuke-free road, deciding to abolish its NPPs by 2025. Both Germany and Taiwan have learned precious lessons from Fukushima. Both governments have listened to the voices of their people. Why can’t Japan’s government do the same? Japan is carrying an ever-expanding financial burden, and has experienced many unexpected tragedies from the use of nuclear power. Japan should be a leader in a worldwide movement to set our planet free of nuclear power. That should be a major part of the compensation paid to those affected by the Fukushima meltdown. 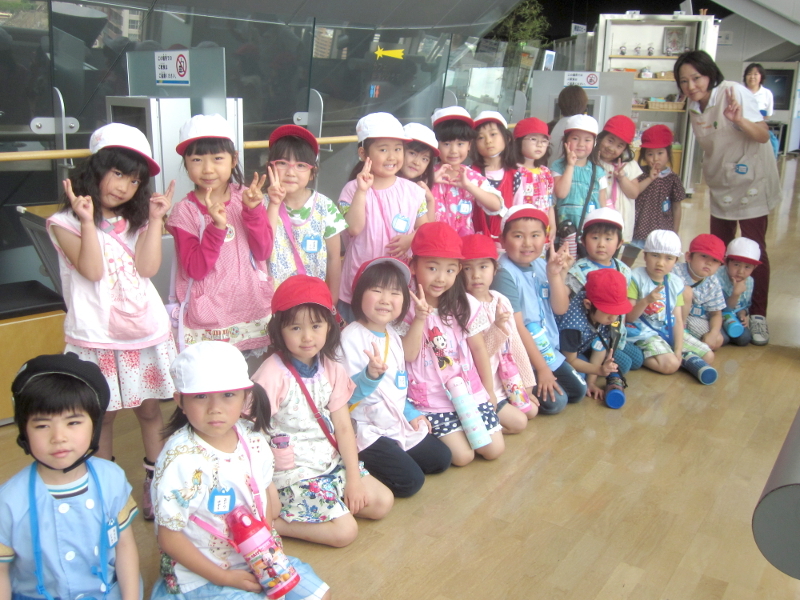 On Friday, June 17th, 2016, the senior children of St. Paul’s Kindergarten, Koriyama, had an outing to Koriyama City Fureai (Fellowship) Science Center. The Science Center is a museum focusing on outer space. 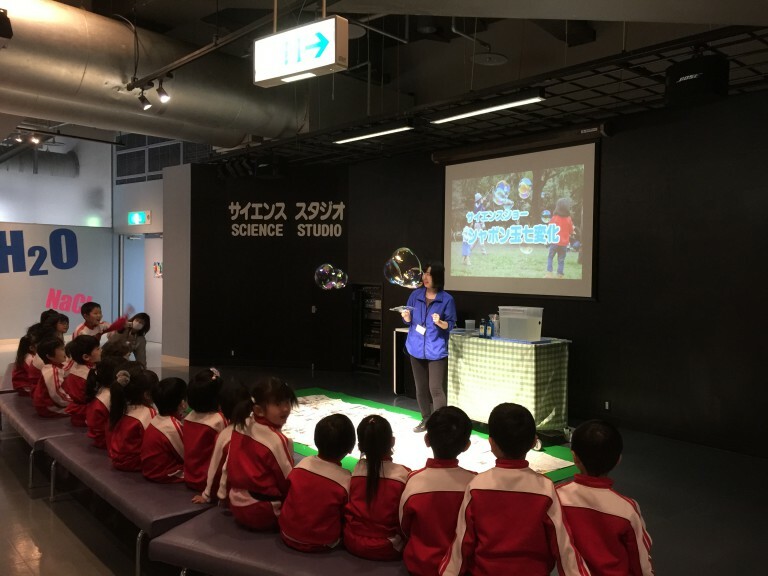 Located in Koriyama, Fukushima, its planetarium is among the greatest in the whole of Japan. It occupies the 20th through 23rd floors of a skyscraper named “Big-i,” which stands on the west side of the Koriyama railroad station. The museum’s planetarium is registered by Guinness World Records as the “highest” planetarium in the whole world. One potential problem was the weather—we expected rain to begin at anytime during the morning; however, there was no rain and the sky later cleared up. 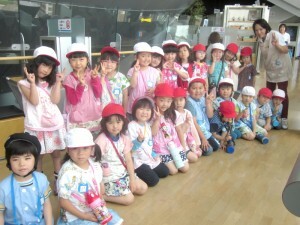 The planetarium runs seasonal programs and, on June 17th, the theme was the constellations of the summer sky. 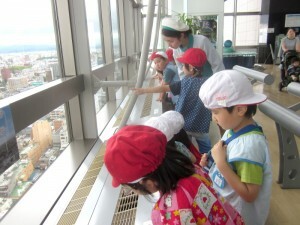 The summer program gave the children easy to understand explanations of the “Tanabata” star festival. (Note: This is an annual summer event in East Asia, whose precise origin is unknown. The event portrays the legend of a female weaver and a cow boy who became a married couple beside “Amano-gawa” or the Milky Way.) 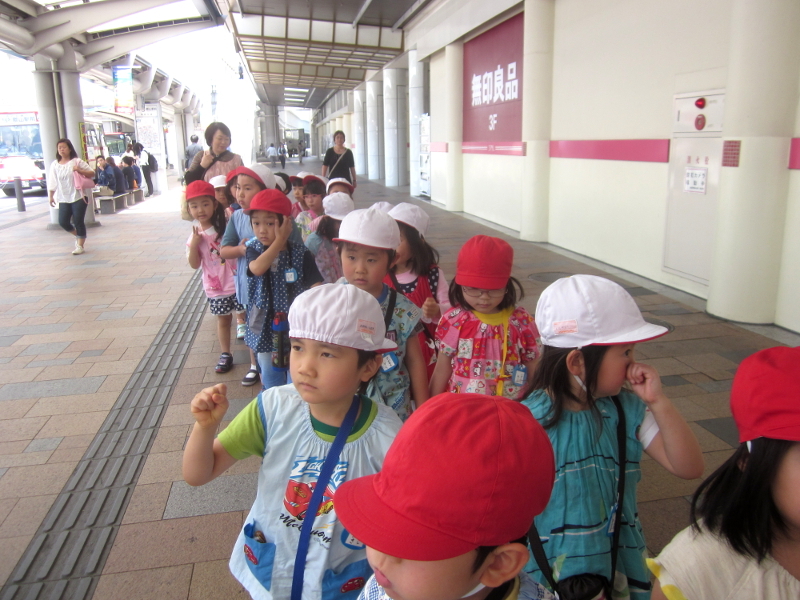 All the children listened very attentively. The children listened attentively to the easy to understand explanations at the planetarium. After the planetarium show, they moved to the observatory in the same building, where they looked down upon the whole city of Koriyama. They shouted out “yippee” as one bullet train after another came into the railroad station. Under the crystal-clear sky, the kids were able to see the whole city of Koriyama. 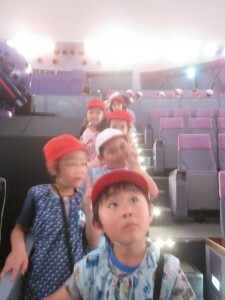 During this outing, the children enjoyed the constellations, stories about them, and the beautiful scenery of the city. 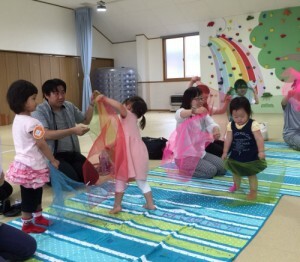 At its “Waku Waku Square,” St. Paul’s Kindergarten, Koriyama, Fukushima, held a program named “Kids’ Yoga and Massage,” targeted at children aged 2 to 3 years and their mothers. The program was meant to provide some time for relaxation to both mothers and their children. 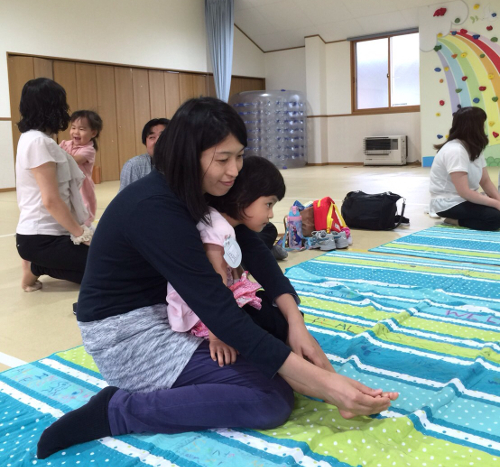 They enjoyed yoga, finger plays, massage with aromatic oil, and so on. The instructor was Ms. Yoshie Hatakeyama. First, they moved their bodies to music. Held in their mothers’ arms, the children greeted one another and were very happy. The instructor explained that kids who have good physical exercise before beginning school tend to suffer fewer injuries at school than those without such exercise. Then, they played with pieces of organdie of many different colors, scrolling them up, spreading them out, and having fun while dynamically moving their bodies. When their bodies were warmed up, their mothers applied oil and gave them a massage. With rounded palms, the mothers tapped on the backs of their kids. Then they took the socks off their kids to apply “circular motion” massaging on the toes and ankles, which made the kids feel great. Then, they made some big rings out of newspaper, and the kids jumped over them and walked through them. 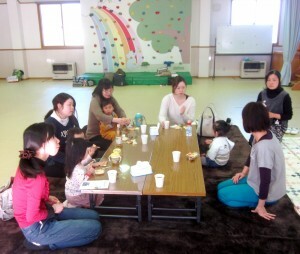 To conclude the program, the instructor and the mothers had tea together. The instructor told a story of how she herself had positive body contact with kids to build a sense of togetherness with them. The parents, all relaxed, listened carefully. The massaging gave everyone a good time, and both parents and children were smiling hugely when the program was over. On March 11th, 2011, soon after the earthquake and tsunami, no one had any hope for tomorrow in the darkness of the hard-hit areas. The earthquake, tsunami, and nuclear meltdown devastated much of the Tohoku region. Back then, no one would have imagined that the region would be rebuilt to what it is today in 2016. We owe this recovery to the countless people who have walked together with us. Still, we have many very difficult problems, for instance, the Fukushima Daiichi meltdown, and radioactive contamination. We have yet to see any solution to these problems. As time goes by, these tragedies can fade from the memories of many, leaving numerous victims forgotten and unattended. On the day the disaster hit, I was living in Sendai, Miyagi (some 95 miles NNE of Koriyama), while my husband was in Koriyama, Fukushima. The disaster destroyed essential utilities, and phone service was mostly unavailable. I simply was unable to find out how my husband was. I was utterly upset. Also, media reports on the Fukushima Daiichi accident were growing worse day by day. In short, the whole situation was getting worse and worse. Five days after the earthquake, the US government specified Koriyama, where my husband was, as an evacuation zone, while Japan’s own government gave no such instructions to evacuate. The Japanese government thus proved that it was not seriously concerned with the lives of its own citizens. Thus, all of us in the affected areas were left to make our own decision as to stay or leave. Overwhelmed by fears, I managed to contact my husband and begged him to leave, even at the cost of his employment. So, he fled Fukushima before his office issued an evacuation instruction. Today, “the daily routine” has come back to us, here in Tohoku, yet I sometimes suspect my husband is now paying a price for his evacuation. Maybe I should not have asked him to flee back then—I still blame myself for that. To the surprise of many around me, four months after the disaster, I moved out of Sendai to Koriyama, to be with my husband who had returned there by then. They asked me, “Why on earth are you moving into that dangerous place! ?” and “Why is it your family does not stop you! ?” The answer was simple. I just could not stand leaving my beloved husband alone in the middle of radioactive danger, while I was in a much safer place. I felt so guilty. Ever since I came to Fukushima, I have been living with tension, carefully trying to avoid the invisible demon called radioactivity. I keep my windows shut, and am quite careful with what I eat and drink in order to prevent exposure to radiation. Meanwhile, my husband seems to have given up on such efforts and does not care about radiation anymore. So, recently, he walks around without a mask even in the middle of a highly radioactive place. I cannot say anything about it, since I know that, given his situation, he just cannot live in a place like this if he is always worried about radiation exposure. In and out of home, radiation is a taboo topic here. With no “right” solution available, every one here has to set his/her own rules. Once you have decided to live here, you have to learn about radiation protection on your own, and make some compromises. Back in 2011, “kizuna” (ties or bonds) was a hot Japanese word all over the nation. The greatest relief I had were the ties I had with friends sharing the same sufferings. Today, five years after the earthquake, here in Koriyama, where I am still living, a calm “daily routine” seems to be back, having replaced the craziness that followed the disaster. Actually, however, everyone living here remains more or less anxious about radiation. In its efforts to rebuild Fukushima and bring people back there, Japan’s government is chanting “safe, easy” to describe Fukushima. If you, however, carry a Geiger counter and take measurements here, you will find a value above 0.23 mSv/h—the threshold for decontamination work—almost everywhere. Moreover, we have hot spots here and there where the measurement exceeds 1 mSv/h. In spite of this, many school kids walk to school without wearing a mask, exposed to high radiation, and they run around the school yard where radioactive dust is in the air. For school lunches, the education board is recommending Fukushima’s own produce. Though many parents buy only food from outside Fukushima, they cannot alter the ingredients of school lunches. (Carrying handmade sandwiches from home to school would force the child to stand out during the lunch.) And these worries are so serious one cannot talk about them easily. 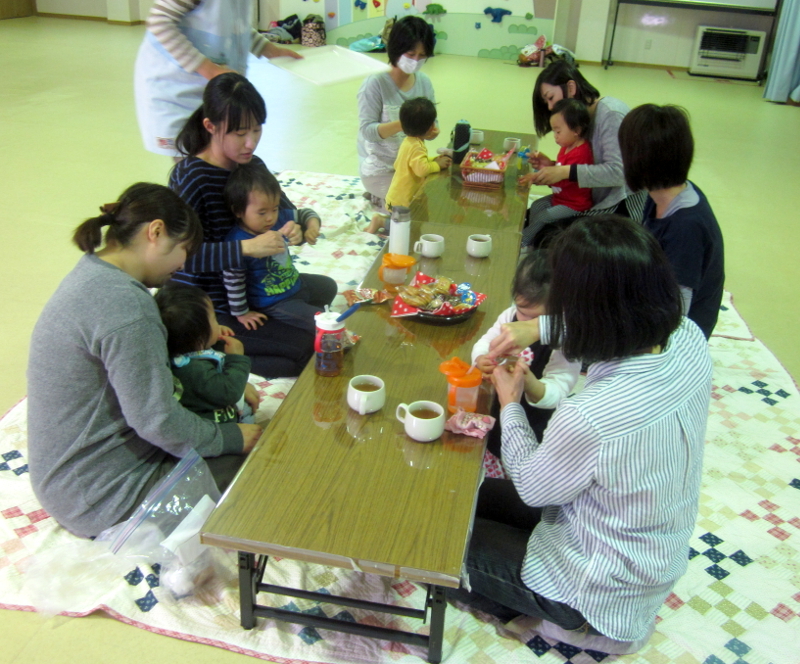 Among neighborhood mothers and between children, if you show your concern over radiation, you will be excluded. The Fukushima Prefectural Government is sponsoring echo examinations of the thyroids of citizens who were 0 to 18 years in age when the earthquake hit. The examination is held every two years, until such people reach 20 years in age, and then every five years after that. As of February, 2016, thyroid cancer has been detected in 116 children, with many children already having undergone an operation. This echo examination takes only 3 to 5 minutes a person, and many people line up to receive it; however, there is no detailed interview conducted before or after the examination. Thus, both the children and their parents worry if such examinations are good enough to detect a hidden health problem. And once such an examination is done, they have to wait two years for the next examination. If an examination finds cancer in an unlucky child, he/she has to have an operation, which leaves a scar on the neck. I am more worried, however, over psychological damage. That child, in the future, will have to confess that he/she received a thyroid cancer operation at every major occasion in his/her life, e.g., when he/she enters a university, gets a job, or gets married. Then, she/he might face discrimination against and prejudice towards themselves as Fukushima residents. This also means that his/her parents could blame themselves, especially because they are deeply worried about their child. So far, no official announcement has been made on the cause-effect relationship of thyroid cancer in Fukushima’s children. Still, we have to keep in mind that, due to what we adults have done with respect to nuclear power, many children are suffering. Now, as I have been part of this Project on Nuclear Power and Radiation, I have had many opportunities to discover the many feelings that Fukushima residents have deep in their hearts. Often, I have been surprised to see people who are usually cheerful actually living with agony and worry here in Fukushima. I have learned that countless people are living in the dark, but are unable to raise their voices. I was ashamed that I was so happy-go-lucky, looking only at the brighter side. My colleagues and I have been striving to bring some light to people living in the dark. Also, I am one who has been helped by those who share my sufferings. I owe what I am today to them. The Year 5 Memorial Service of the 2011 Disaster of Eastern Japan was held 0n February 6th, 2016, at Southwark Cathedral, located close to London Bridge. At the service, Kay Ikezumi, the secretary general of the Project on Nuclear Power and Radiation, was a guest speaker. She described how the areas and refugees hit hard by the 2011 meltdown of Fukushima Daiichi were presently doing. A booth was set up within the cathedral where the Project presented what it is doing. Photos showed how many of those affected by the March 2011 disaster and volunteer helpers have befriended each other. Also, tea towels imprinted with the words “Let Us Walk Together” were displayed. The towels were also imprinted with comments by both those affected by the disaster and volunteers who help them. This was the second memorial service held to remember the disaster. The first one was held in 2013. Five years after the tragedy, in Great Britain, far from the site of the disaster, many people came together for the memorial service to remember those affected by the disaster and their families. The service was proposed by both Britons and Japanese nationals living in the UK. While Ms. Ai Ito, a soprano living in Paris, was singing, Bishop Michael Ipgrave began the memorial service. After the homily, while the organist played a tune well-known to many Japanese called “Furusato (hometown)” on the pipe organ, all the participants tied a tag, in the shape of a cherry blossom, onto two trees beside the altar. This moving event was led by Mr. Motohiko Kato, the envoy extraordinary and minister plenipotentiary at the Japanese embassy to the UK, and the Mayor of Southwark. The cherry blossom tags were distributed to all the participants before the service began. Each tag carried the name of a place where the 2011 disaster had claimed one or more human lives. It was a seal of the promise to remember every life lost, his/her family, and every person who was affected by the tragedy and is still experiencing hardships. The fully ornamented trees were illuminated to represent the hope of rebuilding those hard-hit areas. The February 6th, 2016, edition of a British newspaper, “Church Times,” covered the service. Before and after the service, meetings to report on the harm the Fukushima Daiichi meltdown had caused and what the Project was doing to counteract that harm gathered at several places. At one of the these meetings, someone from a network named “JAN UK” greeted us. It is a network of individuals voicing their opposition to nuclear energy here in the UK, a country which still hosts nuclear power plants. 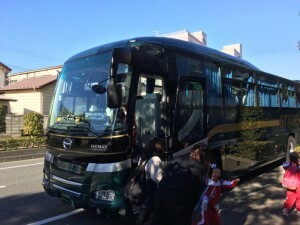 Many of the network members are Japanese nationals. Since August 2012, the network’s members have been gathering in front of the Japanese Embassy in the UK to protest against nuclear energy. Since October of the same year, they have been active before the London office of TEPCO as well. It was Yuki Johnson, an Anglican currently living in the UK, who produced the tea towels. 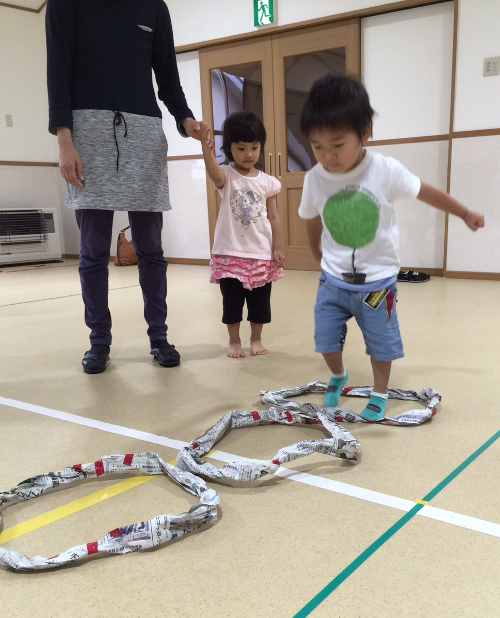 Her wish is that, five years following the 2011 disaster, Fukushima remain in people’s minds. The towel sold for ₤4.5 apiece and, after deducting production costs, Yuki kindly donated the money raised to the Project . We are now witnessing the sad fact that the 2011 disaster and the consequences of the nuclear meltdown are gradually disappearing from the minds of many. Still, as shown above, our Project has been and still is supported by warm help from many concerned people. Our gratitude extends to all those who so generously help us. On Wednesday, February 10th, 2016, the kids of St. Paul’s Kindergarten went on an outing to play in the snow at a facility called “Kokuritsu Bandai Seishonen Koryu no Ie” (National Youth Fellowship House of Bandai) located in Inawashiro Town, in northern Fukushima. 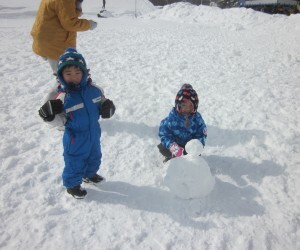 When they arrived, they found more snow drifts than they expected and were overjoyed. The snow storm soon ended, thank heavens. 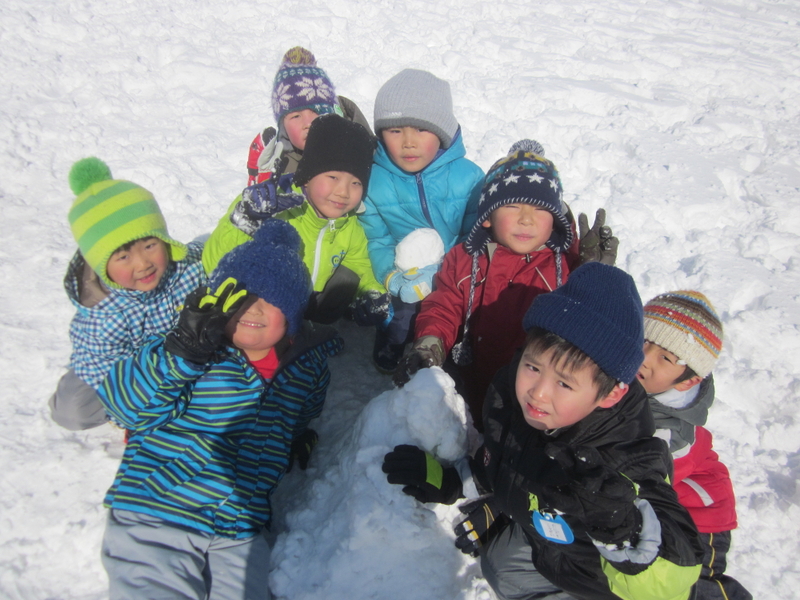 Two of the kindergarten classes, Sakura (Cherry) and Tanpopo (Dandelion), made snowmen and “played mommies” using the kindergarten’s shovels. 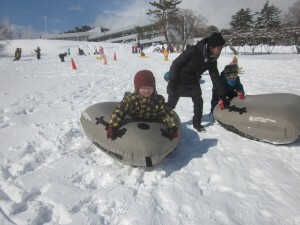 Two others, Momo (Peach) and Hikari (Light), rode sleds and played with playground equipment shaped like a tube, a rounded triangle, and etc. Some of the kids had wild slides down a slope. They had a snowball fight too. They grabbed some snow and threw it at each other, having great fun. This program provided them with a very happy time as they played in the snow with their instructors under the clear blue sky. Exhausted, the kids were all fast asleep on the bus ride home. 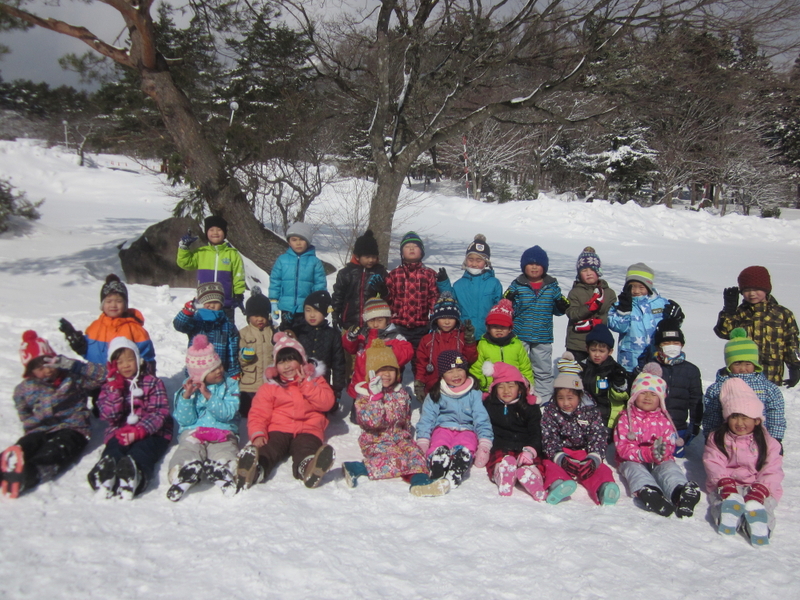 On Friday, January 22nd, St. Timothy’s Kindergarten held an outing to the Civic Center, Hitachi, Ibaraki (some 110 miles NNE of Tokyo). 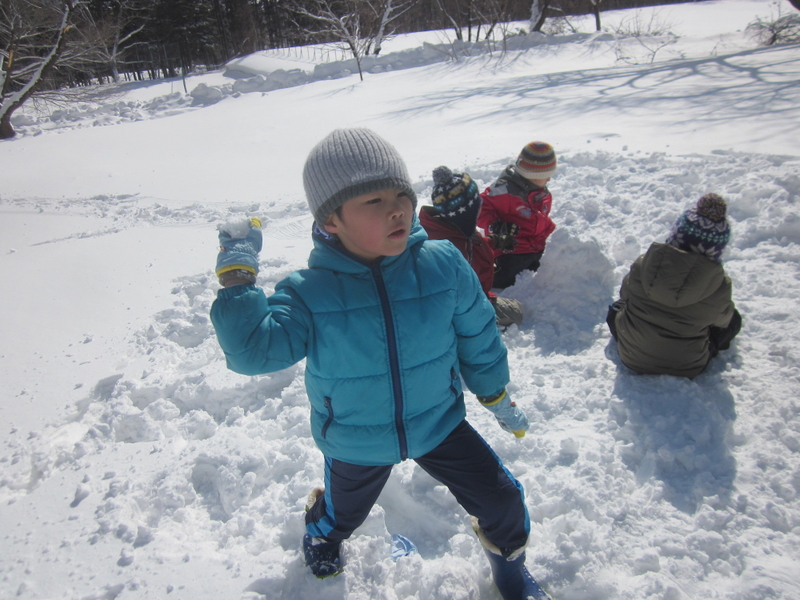 Financed by donations collected to help children affected by Fukushima Daiichi’s meltdown, this outing was held in addition to the kindergarten’s regular outings, to enable the children enjoy a good retreat from all the negative impacts of the meltdown. 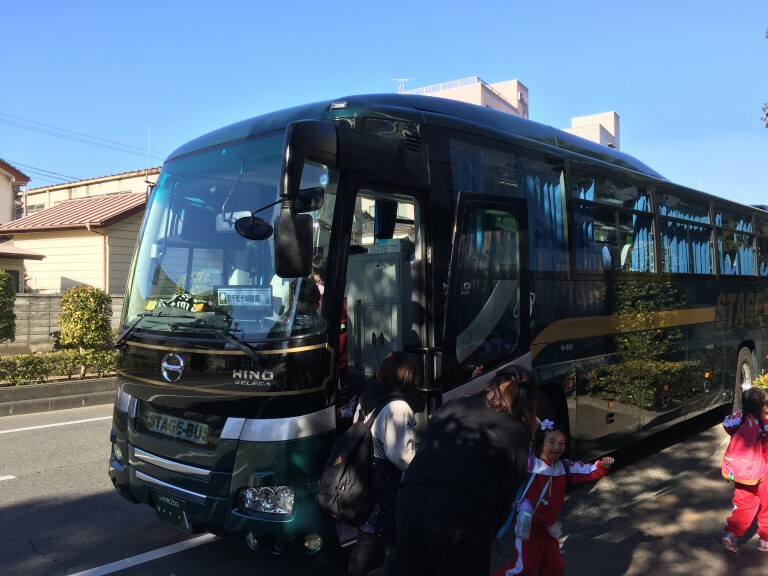 The large bus carrying the kids stopped before the railroad station in Hitachi, and the kids exited the bus with excitement. The Civic Center lets visitors learn through the experience of science, especially physics and chemistry. One attraction was a bubble show. As bubbles, small and large, as well as combinations of bubbles, appeared on the stage one after another, the children cheered aloud. 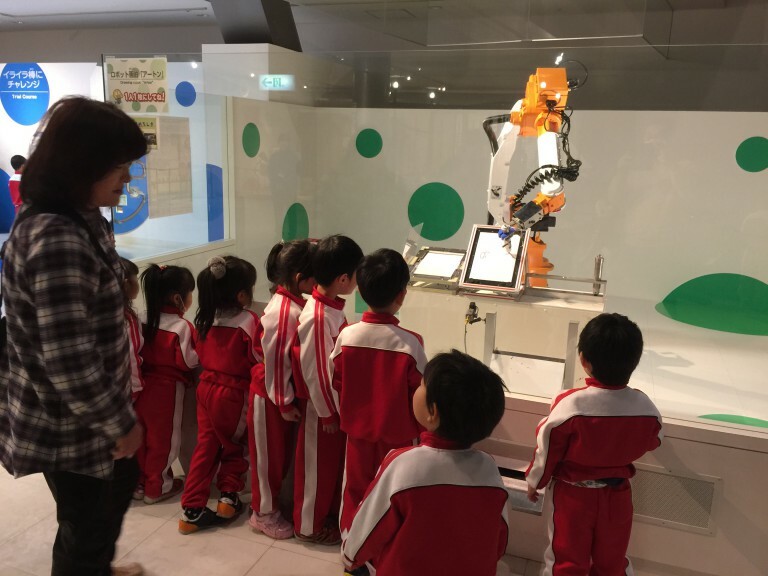 On another stage, an industrial robot made drawings of the mascot character of Hitachi City. The children waited in a long line to receive a drawing made by the robot, which they wanted to take home. The happy ending came too soon. On the bus ride home, most of the children were fast asleep. Once they were back at the kindergarten, however, they woke up and cheerfully told their parents about their happy experiences at the Civic Center. 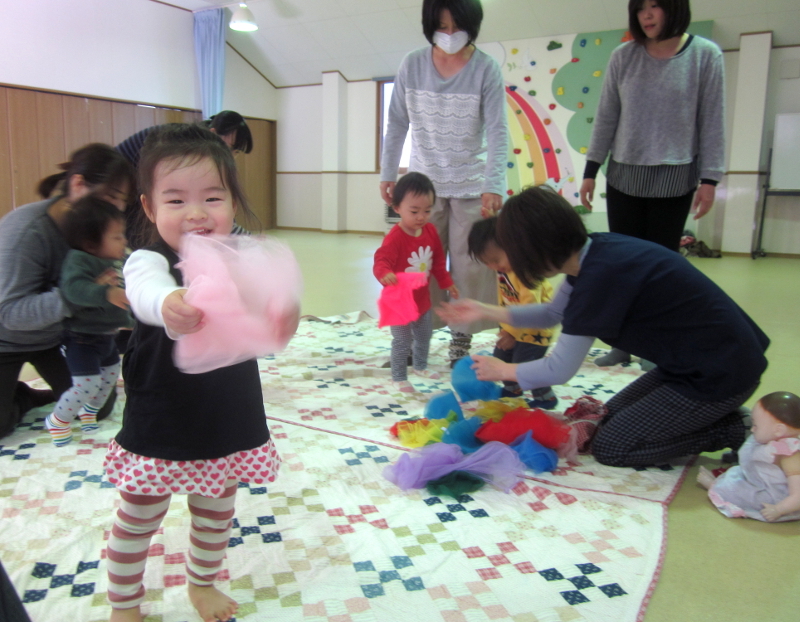 On Monday, January 25th, 2016, at “Waku Waku Square,” St Paul’s Kindergarten, Koriyama, the Project on Nuclear Power and Radiation held a program called “Kids’ Yoga and Massage Class.” The class was attended by children aged 2 to 3 and their mothers. The program let the participating kids and mothers relax fully together. They had a good time, enjoying yoga, “finger plays” (playing with their own fingers as toys, like “This Old Man,” “Where Is Thumbkin?” etc. ), and massages with aromatic oil. 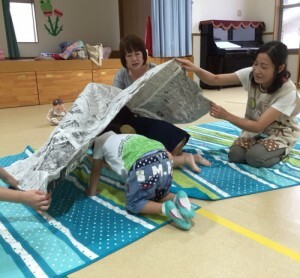 Ms. Yoshie Hatakeyama was the instructor. At first, the kids seemed a bit nervous, but their tension gradually subsided as they did “finger plays” and warmed up doing yoga with their moms. When the kids were free of tension, their mothers massaged them with vegetable oil, beginning with the ankles and gradually extending to the whole body. While being massaged, the kids were totally relaxed and looked sleepy. The massage was followed by teatime and discussion with the instructor. Some mothers asked the instructor questions on parenting, and Yoshie gave them advice. 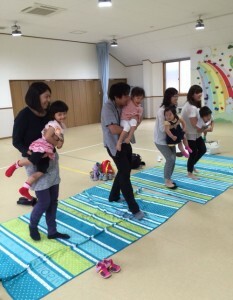 The participants, both kids and moms, had a really good time of relaxation. On Saturday, December 12, 2015, the Low-dose Radiation Exposure and Health Project, an environmentalist group specializing in low-dose radiation and its effects on health, held a symposium titled “Ima Hibaku wo Kangaeru –Chernobyl 30 nen, Watashitachi ga Ima Nasubeki Kotowa” (Considering Radiation Exposure Now – What Should We Do, Three Decades after the Chernobyl Disaster?). I attended the symposium which was held at Citizens Fellowship Plaza, Koriyama City, Fukushima. The following five experts made presentations, which were followed by a Q&A time with the audience. Today, here in Fukushima Prefecture, we are witnessing many cases of thyroid cancer among children, and experts are divided in their opinions, with some ascribing the phenomenon to over-diagnoses. Said Mr. Masamicchi Nishio, one of the speakers at our symposium, “If exposure to low-dose radiation is a major cause of many cases of thyroid cancer among Fukushima children, the exposure must be considerable. Considering the time the cancer takes to develop, the effects of low-dose exposure should emerge fully in the years to come.” In any case, the cause of child thyroid cancer cases should be identified in a few years, according to the symposium’s speakers. Meanwhile, in some of the cases of child thyroid cancer, the cancer has metastasized to the lungs, and cases of adult thyroid cancer are on the rise as well. Fukushima Medical University reports that it has been conducting more operations for adult thyroid cancer over the last few years. Furthermore, thyroid cancer shows a high rate of recurrence—some 36% of cases within 30 years. Medical personnel are, in fact, already witnessing a rise in thyroid cancer cases, according to medical sources. Though I check newspapers daily for news on nuclear power plants and radiation, so far I have never seen a report on such recurrences in any paper. I honestly think there is some bias in press reports. A nuclear disaster, once it hits, destroys the very foundation of life; and its devastative effects last longer than any one person’s whole lifetime. In the case of Fukushima, we have yet to hold any specific party accountable. In fact, to the contrary, the national government, who is to be held accountable, determines radiation related policies and is calling Fukushima “safe.” Moreover, in its efforts to promote the use of nuclear energy, the government is underestimating the risks of radiation. If we do not wish to be deceived by the government, each and every one of us needs to learn objective, scientific facts and think on his/her own. While none of us is able to exercise much influence alone, together we can do something. What we truly need is a democratic society without nuclear power, where individuals’ rights and health are the top priority. 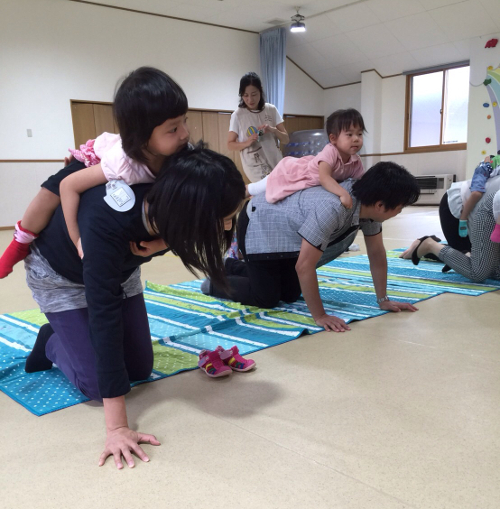 On Monday, November 16, 2015, a “Babies’ Yoga and Massage Class” was held at “Smile Square” within St Paul’s Kindergarten, Koriyama, Fukushima. The Project on Nuclear Power and Radiation, partially assisted the class. This time, five families joined the class, which was led by Ms. Yoshie Hatayama, the instructor. Oil massaging seemed to work magic on the babies, who were quite silent. After the massage, the instructor explained about the oils used and advised the mothers on how to best keep their skin’s moisture. The class was a very friendly and happy one. 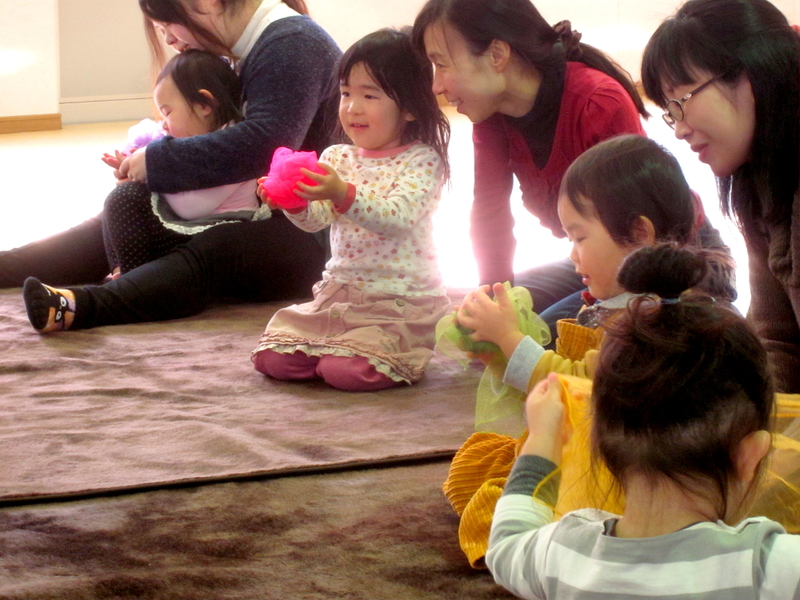 This program successfully relieved the mothers of the daily stress of child-raising. They, together with their babies, enjoyed both mental and physical relaxation. 2016.7.27up / So, what are we going to do in the years to come?